The national transport watchdog has called top managers from South Western Railway (SWR) and Network Rail to a meeting with its board to discuss the ‘declining performance’ on the franchise, following a similar move from ministers. Update: Transport Focus said after the meeting that SWR and Network Rail had vowed to take steps to improve peformance on the franchise. Transport Focus said its board is keen to hear observations from the infrastructure operator and the train company - which took over the franchise during the £800m Waterloo upgrade last August - about the disruption caused by the upgrade and what lessons can be learnt for the future. It said the meeting will also hear how SWR and Network Rail ‘plan to turn around the downward trend in performance over the last 15 months and improve the situation for passengers’. Attending the meeting will be SWR managing director Andy Mellors and Network Rail’s route managing director, Becky Lumlock. Transport Focus chief executive Anthony Smith said: ‘Passengers want a more reliable service and better information when things go wrong. While welcome investment is being made in South Western Railway, passengers need to be able to rely on the trains today. The Department for Transport (DfT) said transport secretary Chris Grayling had called a joint-performance summit with Network Rail and SWR ‘to tackle recent issues on this route’. They discussed ‘how all industry parties could work to bring operational performance to levels that passengers rightly expect and deserve’. Rail minister Paul Maynard will also meet passenger representatives this week to ‘discuss performance issues’. A DfT spokesperson said: ‘The new franchise has promised £1.2bn of investment in stations, new rolling stock and room for more passengers over the next seven years. 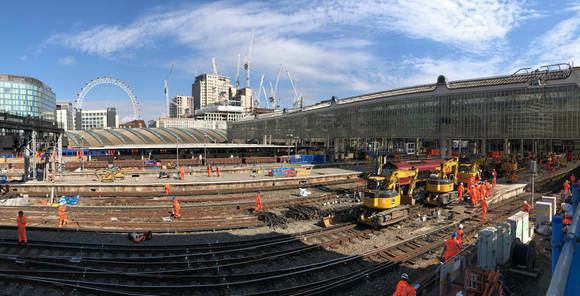 A spokesperson for SWR said: ‘We are looking forward to meeting with Transport Focus, alongside our industry partners Network Rail, to discuss the August 2017 Waterloo upgrade works and what lessons can be learned for similar large-scale programmes in future. The Transport Focus meeting will take place at St Bride’s Institute, London on Tuesday (9 January) at 10.30 – 11.30am, and will be open for members of the public to observe.